We Love Frogs so this by far was the best book and Frog day for the Pond theme in our house! We even have 2 frogs!! 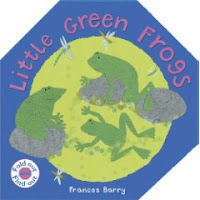 So after reading Little Green Frogs by Frances Barry we had lots of hopping good times! My LO loves how the pages unfold to make a giant lily pad. Summary: Describes how tadpoles develop into frogs, in a book in which the pages unfold and form lily pads with frogs in the center. 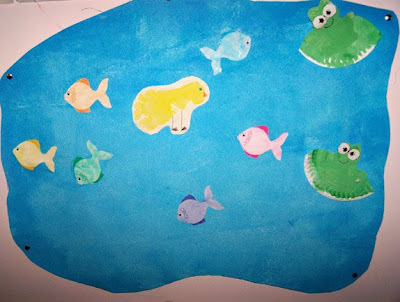 Let dry, cut in half and shape into a lily pad as much as you can! 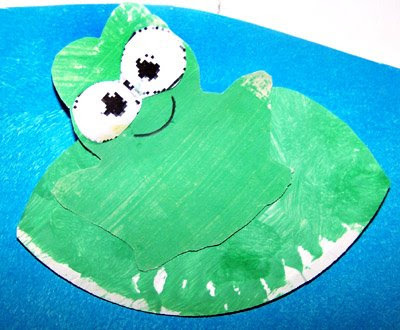 Have your LO pretend to be frogs and hop to each lilypad you can even have them Ribbit!!! Another Variation: Use the extra set of cards to have older tots practice matching upper/lower case FROG! Visit our website to see other POND books and books cooming up! Love it! I'm going to get busy start making my own frog cards. Thanks!